Life with Three: What's on Your Nightstand? I'm not much for the self-help genre. That's not to say that I haven't read more than my fair share of self-help books, but I always find the reading somewhat laborious and (truth be told) I never make changes in my life that last longer than two weeks. I suppose that's more my problem than a problem with the self help books. But. Still. Not too long ago, while reading Kristen's blog , I read about a book titled, For Women Only: What You Need to Know About the Inner Lives of Men. Kristen credits this book with literally saving her marriage. I was intrigued. That's a pretty serious claim. And while I'm not experiencing much in way of marital difficulty (thankfully), every now and then communication will pass between my beloved and me, leaving me scratching my head and wondering if he experienced the conversation the same way I did. You know, the classic Men are from Mars, Women are from Venus Communication Gap. So, I picked up a copy. Shaunti Feldhahn, the author, wrote this book as a result of research she conducted for a novel she was working on. One of the main characters of her novel was a man and, in an effort to accurately portray the thought life of that man, she conducted hundreds of interviews, as well as a professional survey. The results are compiled in this book and are truly enlightening. To use Feldhahn's words, "We all know, for example, that 'men are visual,' but, well...what exactly does that mean?" I'll tell you, it doesn't mean what I thought it did. One of the best things about this book is that it is written in a very easy, conversational style. You can cruise through this book in a matter of days. I've read relationship books in the past that have taken me literally years to slog through. And the best part, is not only did the book help me understand my husband better, it also helped me understand my son and the struggles he is likely to encounter. It's a fantastic book -- well worth a read for the tremendous insight you'll gain. 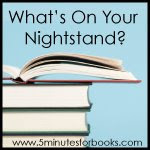 If you're looking for more great reading recommendations, head on over to 5 Minutes for Books and check out the What's on Your Nightstand carnival! Thanks for sharing about that book! I have heard of that author but not of that book so it was helpful to know a little about it. You sound similiar to me in regards to your views on self-help books. But you may have sold me on this one! Thanks! There are few self-help that I have enjoyed reading and actually been able to apply to my life, but For Women Only sounds like a good one. I read Sheet Music a few years ago, and it opened my eyes to the "men are visual" concept. So true. And it doesn't mean what I thought it did, either! And now I realy want to know what "men are visual" means. I'm intrigued! Great review. I loved that it helped you to communicate better with your son as well. My son is getting to that preteen stage where communication is soon to be a slippery slope (although he is a sweet heart!). Maybe reading this will give me an edge! Ok, adding this to my list right now. Like you, we are not having any major marital problems, but better communication can never hurt. Thanks, Michelle! Shaunti goes to my church (well, she was there first when I joined three years ago, so maybe I go to her church). Anyhow,I'd encourage you to read Love & Respect by Emerson Eggerichs. That book saved MY marriage two years ago!